I haven't really gotten too much stitched on it. I did switch out the lighter silk I used for her skin (706) and used 531 instead. It's still a little light, but I think I'm going to leave it. I'm not using the linen that came in the kit, instead I decided to use 32 ct. Antique Cotton by R&R. I got some threads for "A Sampling in the Square" yesterday. I'm not sure when I'll start this, but I think the colors are so bright and pretty! I already had the linen, which is 40 ct. Vintage Buttercream by Lakeside Linens. Well, I have so much to do today - laundry, dishes and cleaning to get ready for the coming week. But all I really want to do today is stitch! What a dilemma! :) Write soon! Everything looks great. I have faith that you'll finish the SB. I'm doing that pesky laundry right now myself. It really does cut into the stitching time. 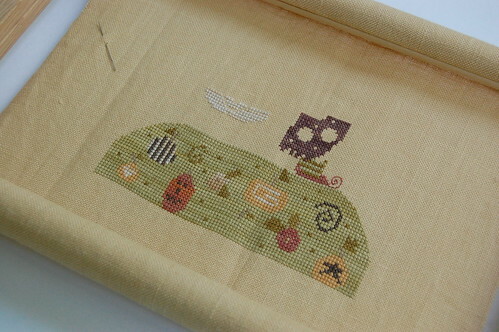 Woah, Happy Haunting sure is stitching-dense!! Way too ambitious for me, but I know you can do it with style, Nicole! Nice to see your My Lady; I'm having fun checking out the progresses on those SALs. Look at all those delicious colors!!! Wow!!! Your WIPs are all so beautiful!!! Love your colors and love the SB. I love your thread...they look so good together. Your Quaker Lady is very beautiful Nicole! Your quaker is looking great - I love her skirt. SB HH is a fun stitch - I'm sure you'll finish it. Thanks for reminding me to pull mine out and put it up! I especially love the SB piece! I hope you get it finished for Halloween! Don't you love Vintage Buttercream? I think I might even like it better than V Lt Examplar! Oh Nicole, I am so proud of you finishing your stocking. I am still working on mine. I will definitely try the muffin recipe. I always enjoy looking at your projects. 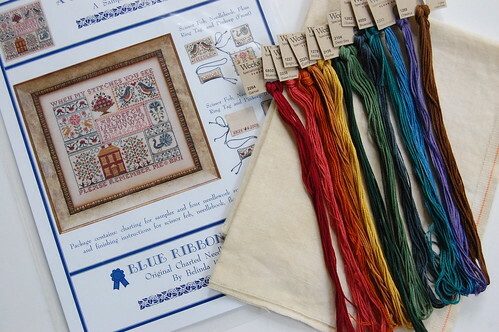 Love your WIPs and your new fibers for the Blue Ribbon piece. 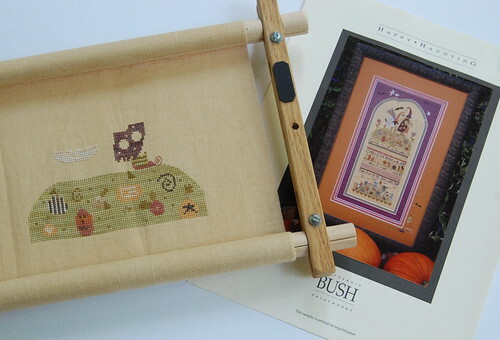 :D As for the housework -- what's more important, housework or stitching? lol! LOVE the Quaker lady you're doing! A bit further down your blog--the muffins look so yummy, and congrats on finishing your Quaker stocking! Gotta love that one. Lady Quaker is looking wonderful ! Love your color choices. I love seeing a new project ready to go! Looking forward to seeing it develop. Lovely stitching on all your wips. You pick such lovely projects I usually want to buy them all after seeing your progress and finishes. I'm determined to finish Happy Haunting this year, too. All of that green on the hill seemed endless...but past that it does go fast. 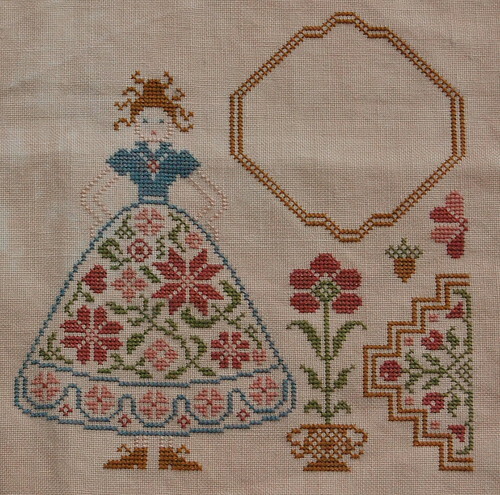 I'm hung up on the pink needleweaving part right now. I think we all understand your dilemma, Nicole. Stitching is always a better option than most things. :) Happy Haunting's looking lovely - I hope you get it finished for this Halloween. Your Quaker Lady is so pretty. I too find skintone a hard thing to get right. Sometimes what the designers pick doesn't always sit well with us mere stitchers. She looks great anyway! My Lady is looking just fabulous!!! Love Happy Haunting, it looks great and I am sure that you can finish it! Don't you love pulling out a piece and getting it finished. I love the green in that and your Lady Q is verrry nice.